A thin film of oxide is formed on the surface of KANTHAL resistance wire when used in oxidizing atmospheres . At high operating temperatures , this film consist of alumina , which has a grayish white color and an appearance as shown in Fig. 1. The alumina protects the material against further oxidation and against chemical attack from the surroundings . In time , however , the oxide layer is destroyed, e.g. by peeling and abrasion. Then the aluminum component of the material diffuses towards the surface to form new oxide. This gradually reduces the aluminum content of the alloy to such an extent that not only alumina is formed , but iron - chromium oxide as well. This grayish-black oxide is porous and affords no protection against further oxidation. The material has spent it's self. Where KANTHAL elements comes into contact with substances which react with alumina , the aluminum content of the alloy decreases rapidly at the parts subjected to attack and iron-chromium-oxide is quickly formed. Pitting gives rise to wart like protuberances , known as carbuncles. Unsuitable supporting bricks or mortar. Attacks by gasses and fumes given off by goods heated in the kiln or emanating from salts and metals or glazes. Splashes from enamels , glazes , or metals. Unsuitable element or support design. Some brick qualities contain substances which have an adverse effect on KANTHAL elements . They cause attacks at the points of contact between the element and the brick , see Fig. 2 The carbuncles extent quickly and at an advanced stage form cohesive fields , see Fig.3 . The exact nature of the impurities which caused the attack should be investigated in each instance. Fig.4 Attack on KANTHAL as the result of exposure to a reducing atmosphere. Certain controlled atmospheres can attack the KANTHAL elements . On the whole it can be said that the more reducing the gas , the more damaging its effect. Reducing atmospheres can also reduce the iron oxide in the bricks, thus impairing their electrical insulating properties. Attacks by gases and fumes given off by goods heated in the kiln. 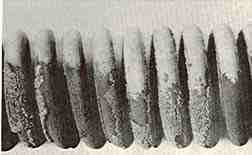 Goods heated in the kiln might give off gases liable to harm the KANTHAL elements . Harmful gases can be given off by enamels and glazes. Such attacks have no characteristic appearance but mostly take the form of carbuncles. Providing an attack has not reached too advanced a stage, its cause can generally be established by spectrographical analysis. 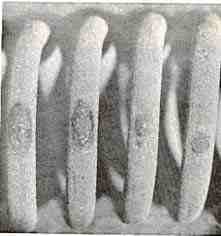 Fig.5 shows a KANTHAL elements which was attacked by glazing fumes. Gases and fumes also penetrate into the furnace bricks, which means that replacement elements may have a shorter life than the original elements. Fig.6 Attack caused by glazing splashes. Splashes from enamels , glazes , salts , metals. Attacks caused by splashes from materials treated in the kiln are usually of a localized character. By their color and characteristic appearance , splashes from enamel and glazes can often be diagnosed as the source of the trouble by purely visual examination. Fig. 6 shows attacks caused by glazing splashes. Elements which have the appearance as shown in Fig.7 are totally or partially melted . Only the durability of the oxide layer has prevented the fused metal from running out. Overheating can be due to faulty element calculation , incorrect furnace or kiln dimensioning , obstructed heat transfer , malfunction or incorrect positioning of temperature controlling device or stuck or fused contactor. A common reason for obstructed heat transfer resulting in overheating is the covering of the bottom elements with a kiln shelf of low heat conductivity. The higher the temperature, the longer the soak, the sooner the element will decrease in life. Usually short soaks work fine. Make sure all elements are heating. If all elements are not doing their share of the work then the other elements will not last as long. Excessive soaking time will accelerate increase in element resistance. Contamination (such as glaze or kiln wash). Silica, a main ingredient of both of these,attacks the element wire. Glaze accidentally rubbing off into holder or rod and on element in loading kiln. If such rub off occurs immediately vacuum thoroughly. Glaze will cause very rapid failure. Blow ups or explosion of bisque ware cause small pieces of clay to be blown into holder and element. If not immediately removed clay may melt contaminating element and element holder. To avoid this make certain clay is very dry before firing and, in the case of heavy handmade pieces, fire on low for a long period until you are sure ware is dried out thoroughly. If you hear a "pop" when firing such pieces, stop firing, cool the kiln. If blow-up has occurred, vacuum all element grooves very thoroughly. Firing pieces too close to elements. We recommend at least 1-1/2" from piece to element. Further if large flat surfaces are parallel to kiln wall. Reducing atmospheres will destroy elements. Do not use wood chips, oils and other materials to generate a reducing atmosphere. A very rapid element failure may result. NOTE: Reducing atmospheres are the opposite of oxidizing atmospheres (plain air is an oxidizing atmosphere). The word reducing comes from the ability of a reducing atmosphere to "reduce" oxides. Are any waxes, oils, carbon, fluorine, fumes present? Are you using any lead glazes? Iron-Chrome-Aluminum elements require an oxidizing atmosphere to give dependable service. The aluminum in the element forms a protective aluminum oxide. Oil from tools or carbon from wax burnout will attack the element coating. Halogens such as chlorine or fluorine will attack the elements. Molten metals, for instance, zinc, aluminum and copper, react with iron- chrome-aluminum elements. The salts of the alkali metals, halogen salts, nitrates, silicates, and compounds of borax, disturb the formation of oxide and are, therefore, harmful to these elements. 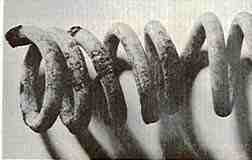 This is also true of the oxides of such metals as copper, lead and iron. Do not use with free carbon. 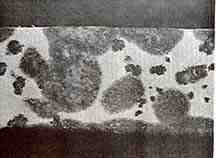 Lead oxide attacks the protective alumina oxide coating on the element. If you are using lead glaze (or are creating any of these other problems) be sure to use a kiln vent. Also try firing every other load or as often as you can with a non corrosive load (such as a bisque firing). This will help the element restore its protective alumina oxide coating. They don't live forever , they are a very important part in any kiln , they have a very hard life and they do wear out and needs to be replaced before they totally pack up. Most contactors and relays have a lifespan of many millions operations in which they switch high voltage and high current of many amps to the elements , by doing this the contacts will burn in . In the most worst scenario the contacts weld up and the kiln will keep rising in temperature , in this case NOTHING will stop this kiln from melting down , only the FE Multi Profile controller will sound a alarm but won't stop the kiln until the elements burn out , in most cases all kiln shelves will be badly sagged and become one piece with your pots . 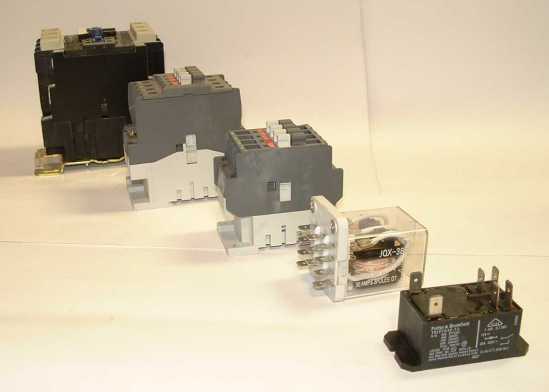 Our advice is to replace the contactor or relay's after a few years depending on the use of the kiln , we have available a variety of contactors and relay's .